Six British teams in the Champions League draw – which one has the best chance of winning it? So there are six (count ’em!) clubs in the group stages of this season’s Champions League: the big four in England, plus Celtic and Rangers. The English clubs can’t meet each other, because they are all amongst the top eight seeds, but there’s a very strong chance that we’ll see another so-called ‘Battle of Britain’, namely an England v Scotland group showdown. So which of the British teams has the best chance of winning the tournament? Celtic and Rangers are obvious outsiders, because, well, they’re not as strong as the English clubs. Chelsea, Man Utd and Liverpool all have extremely strong squads (although Man Utd should sign another striker before tomorrow’s transfer deadline), whilst Arsenal have enough quality to go all the way, as long as they don’t pick up injuries to key players (Fabregas and Van Persie). 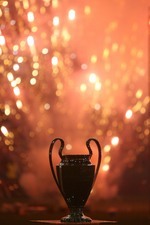 Roman Abramovich is desperate to add the CL trophy to his bulging cabinet and will want Jose Mourinho to focus on Europe. For that reason, I’d say that Chelsea has the best chance, followed by Liverpool, with Arsenal and Man Utd as outsiders. Liverpool are perhaps the team Barca would like to play the least Col, because of the clash of styles – no team in Europe likes to pit wits with Benitez. But I agree that Barca are clear favourites to win it. It’s gonna be Real, mark my words. Sneijder can carry that team, and Van Nistelrooy is still great in front of goal. I can’t see a clear favourite. Real have a very strong team this year, I’d put them up there with Barca and Liverpool. Liverpool are stronger than they’ve ever been in recent years, but if they are fighting for a Premiership, it might affect their Champions League form. Valencia and Chelsea could quite easily knock any of these teams out over two legs, although I doubt they have what it takes to get to the final this year. Chelsea will do better in the league, they’re set up to crush all but the elite of Europe but are cowardly when they do face the big boys. Those sneaky bastards from Anfield might just sneak it. Hi i wanted to know if the draw was to be shown on any other channel except sky sports that include if it would be streamed ?? ?